Maria Donata Montanaro first appears at Painesville, Lake County, Ohio, in 1932. When she immigrated to the United States Painesville, Ohio, was hes destination. In America Maria Donata Montanaro was known by her married name Mary D. Cardina. Maria Donata Montanaro, daughter of Giuseppe Antonio Montanaro and Maria Incoronata Morsella, was born on May 17, 1898, at Frosolone, Isernia Province, Molise, Italy. She was baptized on May 17, 1898, at Frosolone, Isernia Province, Molise, Italy. 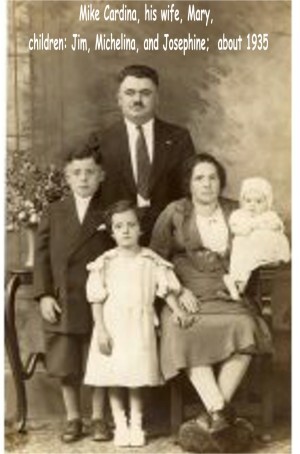 Maria married Michele Cardegna, son of Giacomo Cardegna and Michelangela Fraraccio, in 1920, at Italy. Michele Cardegna was also born at Frosolone, Italy. Maria Donata Montanaro died on October 25, 1978, at Greenlawn Nursing Home, Concord Township, Lake County, Ohio. Her body was interred at Riverside Cemetery, Painesville, Lake County, Ohio. Maria Donata Montanaro, age 34, immigrated to the United States on June 20, 1932, travelling to Painesville, Ohio. Maria and her husband, Michele Cardegna, were escorting their her children, Giacomo Cardegna and Michelina Cardegna, to Painesville. They arrived in the United States at the Port of New York City aboard the ship SS Conte Grande. Maria Donata Montanaro was enumerated for the 1940 Census of the United States, on April 11, 1940, living at 250 Richmond Street, Painesville, Lake County, Ohio, as a wife of Michele Cardegna. Maria Donata Montanaro was enumerated as Mary Cardina. Maria Donata Cardegna became a citizen of the United States on August 8, 1943. Maria resided at 250 Richmond Street, Painesville, Lake County, Ohio, when she was naturalized. 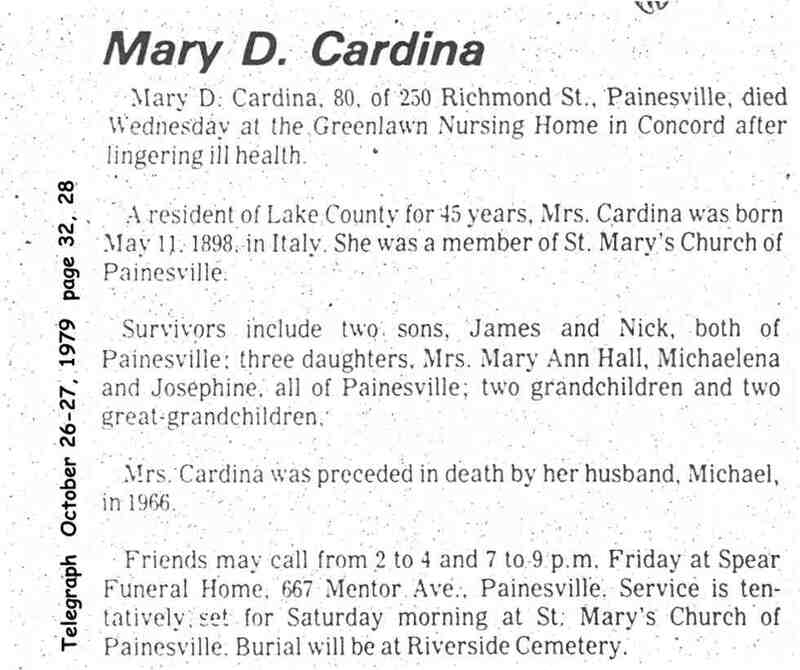 Maria Donata Montanaro was widowed by the death of her husband, Michele Cardegna, on December 20, 1966, at Painesville, Lake County, Ohio.